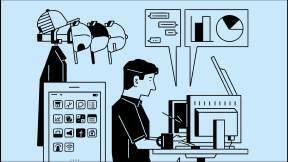 We live in a data-driven world. Around the city, Google Maps tracks our location, making commuting as easy as entering point A and point B. At home, sleep apps measure our REM cycles, Amazon reviews influence what we buy and the latest weather radar lets us know if we really need to bring that umbrella. Despite the significant number of quick decisions we make based on of data on a daily basis, step into most offices today and you’ll discover that decision-making and change is a lengthy process. With global competition and disruption now the norm in business, organizations can’t afford for change to happen at a leisurely pace. Survival requires rapid adaption, innovation and growth. 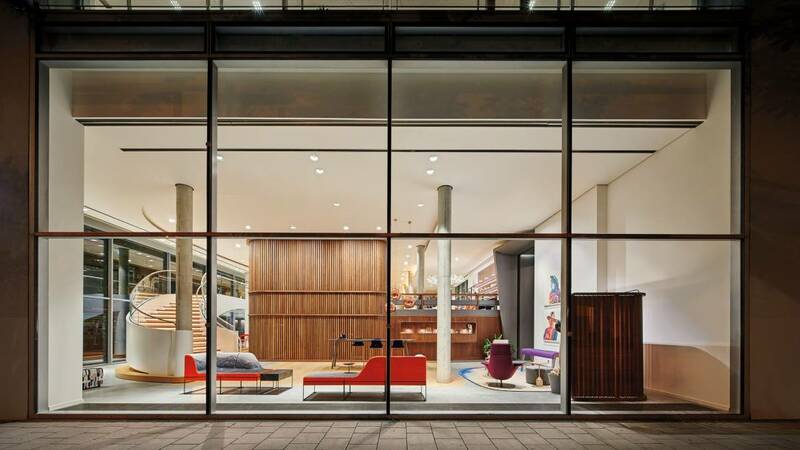 Steelcase is keeping pace with today’s accelerating change in the heart of Munich with the company’s latest Learning and Innovation Center (LINC). A hub on the company’s worldwide network, the LINC is a place where employees build strong connections and collaborate with each other and their colleagues around the world. It is also a place that echoes the company’s belief that place matters. The LINC is designed with an understanding of how learning, creativity and innovation interconnect, demonstrating how the habitats where people work can activate a culture shift by fostering a new set of habits. 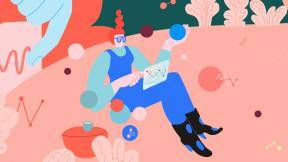 “Behaviors change when mindsets change, and that happens through the experiences people have at work,” explains Laurent Bernard, vice president of Steelcase global talent management. 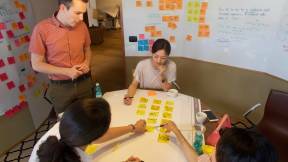 A customer showcase for product and purpose, the LINC exhibits how human-centered design propels learning and growth. THE LINC Three interconnected buildings with distinct functions create the unique LINC ecosystem. Building G welcomes guests at reception and features the WorkCafé, Leadership Community and a cluster of workshop and studio spaces. It is shared by employees from in and out of town, visitors and clients. Buildings E and F are focused primarily on research and development and are restricted to residents, except for the Learning and Development Floor which is open to visitors. Areas in E and F house individuals and teams as well as diverse maker spaces, prototype studios and model shops. One way Steelcase is making the office more human may at first sound counterintuitive — technology. 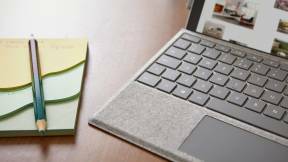 Steelcase Workplace Advisor Study (WPA Study) is a short-term, episodic study that provides organizations with an understanding of how their people are working. Delivered through actionable, easy-to-understand data and analytics, WPA Study empowers facility and real estate managers with knowledge regarding what sizes and types of spaces best support workers. 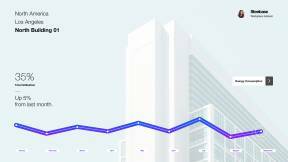 This quantitative data is combined with employee surveys on the spaces people prefer to work in, offering facility managers proof that specific furniture decisions are getting a high return on investment. 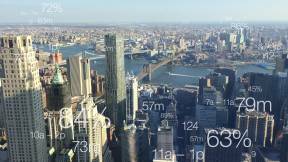 The data also provide real estate leaders with the numbers they need to make decisions on major capital investments. By providing spaces that cater to the unique way people work, organizations can make real estate more efficient, potentially reduce real estate costs and increase employee workplace satisfaction and engagement. Steelcase developed a set of experience and design principles to guide the vision and development of the LINC. To understand how space was being used, measure the effectiveness of the principles and uncover areas of improvement, the Steelcase Applied Research and Consulting team (ARC) narrowed the goals of WPA Study at the LINC to three key things. Spaces were segmented into one of four typologies to provide a greater understanding of the space and effectively support future decision-making. Sensors were strategically placed throughout the three buildings and from January to March of 2018 data was collected 8 a.m.–4 p.m. each work day. 1. Use mobility to stimulate cross-functional connections and apply a progressive sharing ratio in I spaces. 2. 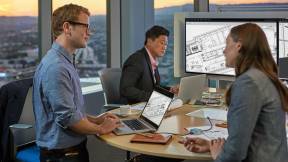 Enable collaboration by assigning the majority of the space to collaborative settings. 3. Enable autonomous work by providing a large diversity in spaces. 4. 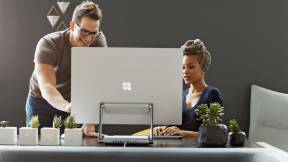 Enable connections between customers and employees by creating a shared social area, the WorkCafé. 5. 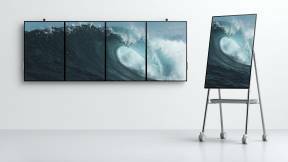 Facilitate distributed work by providing ample spaces with audio and/or video teleconnections for virtual collaboration. 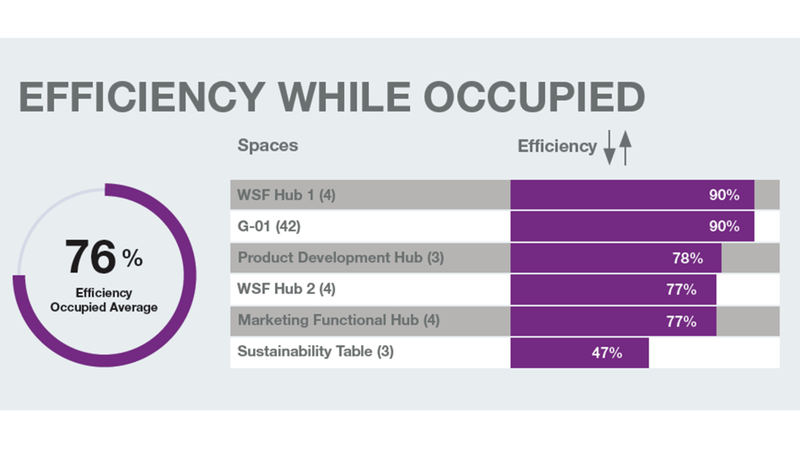 The WPA Study dashboard revealed insights into the occupancy of spaces, which tools and settings are highly desired and if the supply and demand for individual and collaborative spaces are balanced. 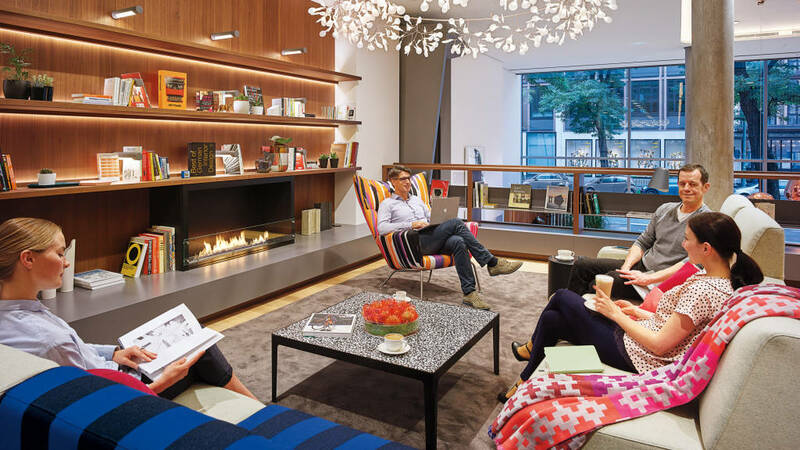 In addition to the facts and figures, the ARC team surveyed Steelcase employees to get qualitative data around which spaces were employee favorites. To work individually, employees favored Building G, the only building that all employees and visitors have access to. These floors host a variety of ancillary spaces that provide a warm and informal atmosphere, making it a popular place to meet one-on-one with another colleague. Due to the high demand for privacy in Building G, after the study, three acoustically-sound Office Bricks pods were installed to provide critical space for people to concentrate and share confidential information in a mostly open-plan office. 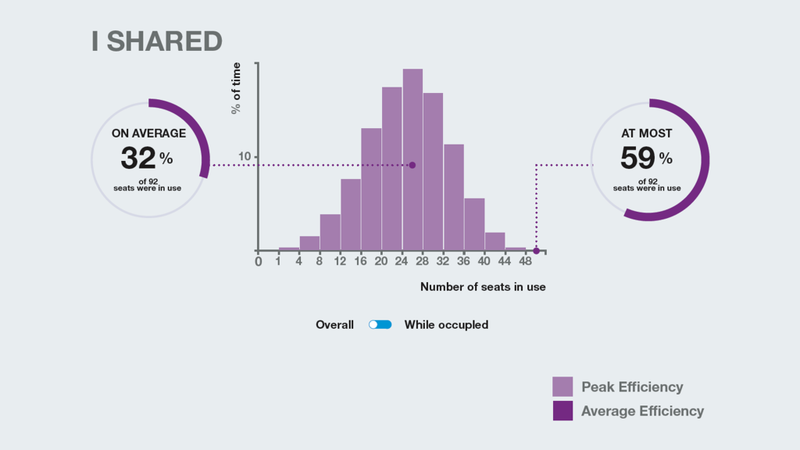 On average, 32 percent of seats in individual-shared spaces were in use. With the overall occupancy being low, the ARC team recommended reconsidering the number of owned desks and further increasing the sharing ratio of I spaces. 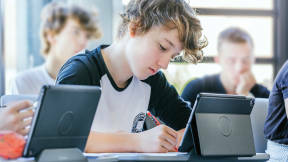 I and WE spaces showed equal occupancy rates, indicating the balance between both types of spaces is correct. 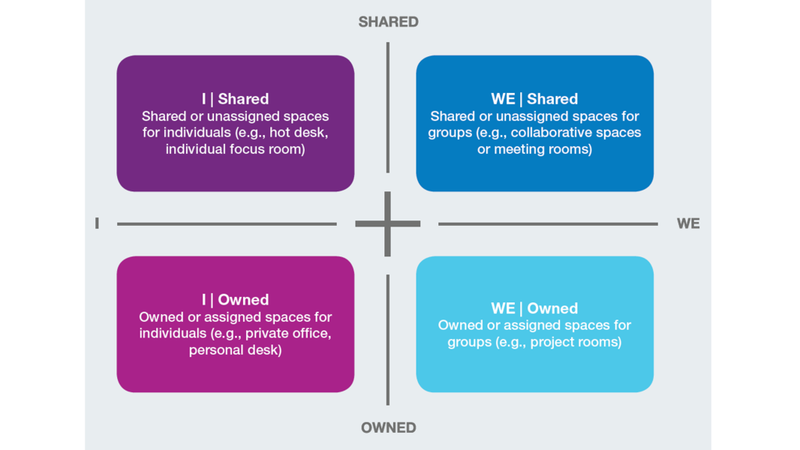 Regarding shared collaborative spaces, meetings occurred most often in either groups of three to six, or two people. The supply met the demand for meeting rooms to host three to six people, while additional smaller meeting spaces were needed. “After seeing that the majority of collaboration happens in small groups, we suggested a potential increase of two-person spaces and a decrease of larger spaces,” says Annemieke Garskamp, an applied research consultant for Steelcase. The Office Bricks pods also offer a solution to this issue, providing a quiet place for two people to connect. Team-owned areas had a high efficiency-while-occupied rating, which is calculated by dividing the total number of occupants by total capacity over time. 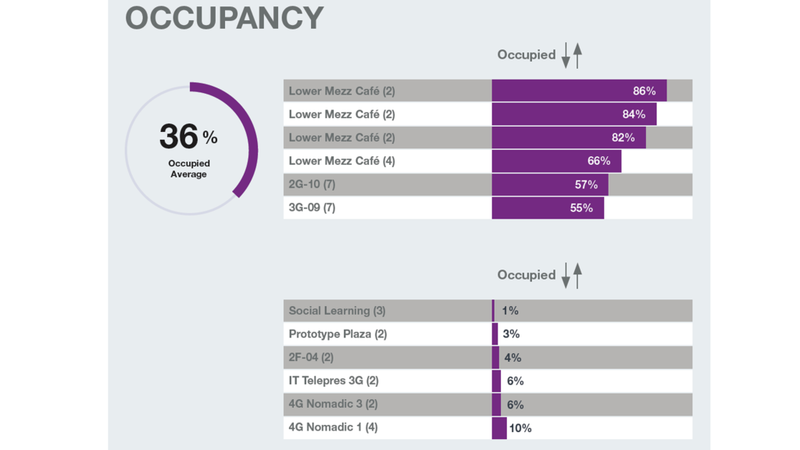 This high occupancy rate indicates the spaces are the right size and have the tools people need for collaborative and creative work. “The use of telepresence units was spread over buildings,” says Garskamp. In community spaces, use greatly varied depending on the space, with the WorkCafé among the most occupied areas in the LINC. This insight again confirmed the hopes of the design team, as the WorkCafé was intended as a social hub where everyone at the LINC can connect. 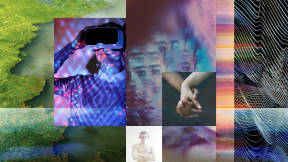 “It’s all about sharing resources, blending boundaries and interacting as a cohesive community,” says James Ludwig, vice president, global design and engineering. With these goals in mind, WPA Study allowed Steelcase to discover if the LINC is being used as intended and what things could potentially change to make the space more efficient and enjoyable. As work continues to evolve, Steelcase plans to continuously utilize WPA Study to make sure the LINC is meeting the needs of employees. 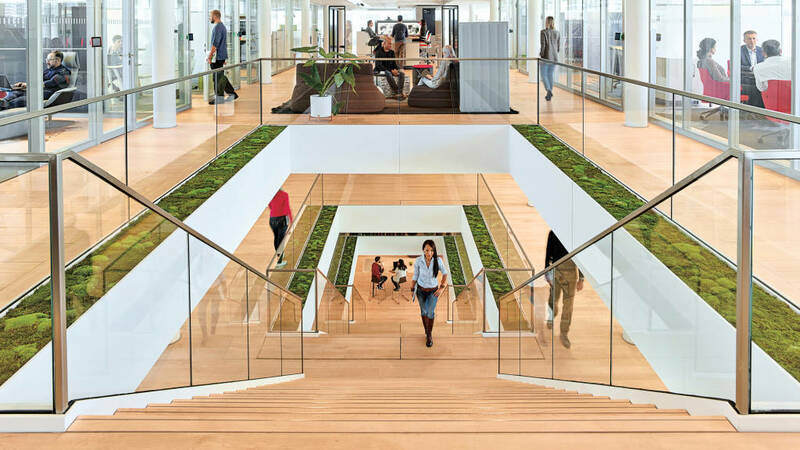 By engaging the people that use the spaces every day, Steelcase combined thoughtful qualitative data with hard quantitative facts to deeply understand where things were working and where they weren’t. In the end, this knowledge was the proof needed to initiate change and resulted in a more human-centered workplace. You can find more information on the Steelcase Workplace Advisor Study and how it could be leveraged to help optimize your work environment here.